[163 pages Report] The global predictive analytics market is expected to grow from USD 4.56 billion in 2017 to USD 12.41 billion by 2022, at a Compound Annual Growth Rate (CAGR) of 22.1%. Predictive analytics assists companies in determining the patterns of data, predicting the future outcomes and trends, anticipating events, spotting anomalies, forecasting using the what-if simulations, and understanding changes in customers’ behavior. The predictive analytics market is expanding with the emergence of new applications and technologies. Predictive analytics is being used in various domains including financial analytics, risk analytics, marketing analytics, sales analytics, customer analytics, web and social media analytics, supply chain analytics, and network analytics. The base year considered for the study is 2016, and the forecast has been provided for the period between 2017 and 2022. Telecom companies are thriving to be innovative and maximize their revenue by implementing right tools at the right place to harness massive volume, type, format, and velocity of data in order to leverage on actionable insights from that data. Telecommunication companies are managing terabytes of data stored in silos and scattered across the organization. Thus, for faster and easier processing of useful data, telcos are searching for a driven data advanced analytics solution to achieve accurate real-time insights through data mining and predictive analytics. The research methodology used to estimate and forecast the predictive analytics market begins with capturing data on key vendor revenues through secondary research, which includes directories and databases (D&B Hoovers, Bloomberg Businessweek, and Factiva). The vendor offerings have also been taken into consideration to determine the market segmentation. The bottom-up procedure was employed to arrive at the overall market size of the global predictive analytics market that was derived from the revenue of the key players in the market. After arriving at the overall market size, the total market was split into several segments and subsegments, which were then verified through primary research by conducting extensive interviews with key people, such as Chief Executive Officers (CEOs), Vice Presidents (VPs), directors, and executives. The data triangulation and market breakdown procedures were employed to complete the overall market engineering process and arrive at the exact statistics for all segments and subsegments. The Predictive Analytics ecosystem comprises vendors such as Alteryx (US), AgilOne (US), Angoss Software (Canada), Domino Data lab (US), Dataiku (US), Exago (US), FICO (US), GoodData (US), IBM (US), Information Builders (US), Kognitio (UK), KNIME.COM (Switzerland), MicroStrategy (US), Microsoft (US), NTT Data (Japan), Oracle (US), Predixion Software (US), RapidMiner (US), QlikTech (US), Sisense (US), SAP (Germany), SAS Institute (US), Tableau Software (US), TIBCO (US), and Teradata (US). Other stakeholders of the Predictive Analytics market include vendors, research organizations, network and system integrators, predictive analytics managed service providers, Business Intelligence (BI) solution providers, marketing analytics executives, third-party providers, and technology providers. These Predictive Analytics Software Vendors are rated and listed by us on the basis of product quality, reliability, and their business strategy. Please visit 360Quadrants to see the vendor listing of Predictive Analytics Software. In April 2017, The Weather Company, an IBM business introduced new outage prediction solution particularly designed to assist utility companies to proactively be prepared for and respond to weather-related outages. This new solution is to enable storm operations and emergency management teams to make more informed decisions to enhance restoration times and save the utility millions of dollars annually. In February 2017, Oracle expanded its IoT portfolio with the introduction of 4 new cloud solutions to assist businesses to fully utilize the advantages of the digital supply chain. By applying advanced predictive analytics to devise signals, IoT applications can help in automating business processes and operations across the supply chain to enhance customer experience. In March 2015, Microsoft acquired Revolution Analytics, a provider of services for the open source R programming language for statistical computing and predictive analytics. This will strengthen Microsoft’s analytics offerings. What are new application areas which the predictive analytics companies are exploring? 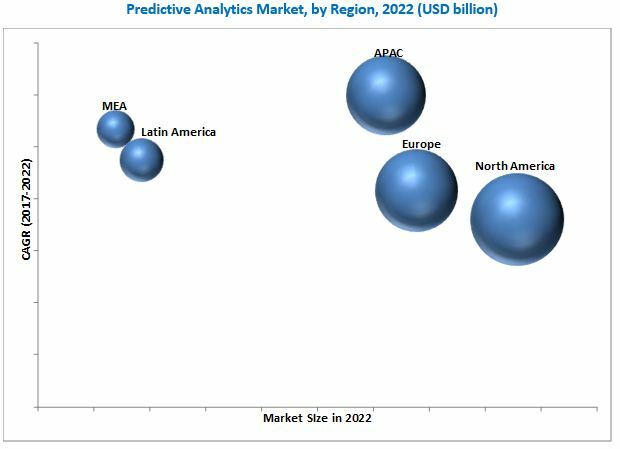 The global predictive analytics market is expected to grow from USD 4.57 billion in 2018 to USD 12.41 billion by 2022 at a CAGR of 22.1%. Increasing volumes of data generated across various industries, growing focus on market and competitive intelligence, and the need for advanced analytics to predict future outcomes and customer requirements are the key factors driving the growth of this market. Traditional analytics platforms use static and stored data to analyze simple or complex patterns and react to any business situation. These platforms may take days to analyze and weeks to act on the stored data. However, predictive analytics has the advanced analytics capability of extracting meaningful information from present as well as historical data sets. It assists companies in determining patterns in data, predicting the future outcomes and trends, anticipating events, spotting anomalies, forecasting using the what-if simulations, and understanding changes in customers’ behavior. The predictive analytics technology is the core enabler of big data, allowing businesses to use historical data and combined it with customer insights to predict future events. The combination of real-time data streams, AI, machine learning, and predictive analytics has the potential of delivering competitive business advantages. The predictive analytics market has been segmented into solution and service. Solutions considered for the predictive analytics market include financial analytics, risk analytics, marketing analytics, sales analytics, customer analytics, web and social media analytics, supply chain analytics, network analytics, and others (HR analytics and legal analytics). Services include managed services and professional services. Professional services are further classified into consulting, and support and maintenance. The risk analytics solutions segment is expected to have the largest market size in the predictive analytics solutions market. The customer analytics solutions segment is expected to witness the highest growth rate during the forecast period. The predictive analytics market in APAC is expected to grow at the highest CAGR during the forecast period. Growing technology investments and improving penetration of the retail and manufacturing sector are expected to drive the market growth of APAC during the forecast period. The BFSI industry is one of the biggest industries in the APAC region, followed by manufacturing, and telecommunications and IT. Due to the global competition, higher productivity at low cost has become the highest priority for local manufacturers, which need to be addressed immediately to stay competitive in the market. Companies in this region continue to focus on improving their customer service to drive the competitive differentiation and revenue growth. This is pushing companies to explore hosted and cloud alternatives for premises-based systems. Fast-growing countries, such as China, India, Singapore, Malaysia, and Australia are rapidly moving toward cloud adoption. In the current competitive business scenarios, companies need more than accurate financial statements and reports from its financial analytics. Companies now need more forward-looking, predictive insights that can help them shape impactful business strategy and improve the day-to-day decision-making in real time. Financial analytics solution with predictive analytics capability can assist companies by combining internal financial information and operational data with external information such as social media, demographics, and customer trading habits which may address critical business questions with unprecedented ease, speed, and accuracy. Risk analytics mainly cover the enterprise risk associated with financial risk, operations risk, or risk associated with organization’s network efficiency. Organizations use risk analytics solution to enhance their risk intelligence capabilities to fight risk exposures. By using advanced analytical frameworks, companies can avoid, address, or quickly recover from major risk events. Marketing analytics is important for measuring, managing, and analyzing marketing performance to maximize the effectiveness of marketing campaigns and optimize Return on Investment (ROI). Marketing analytics can offer profound insights into customer preferences and trends. It gathers data from across all marketing channels and consolidates it into a common marketing view. From this common view, companies can extract analytical results that can provide invaluable assistance in driving their marketing efforts. Sales analytics helps the sales executives to identify cross-sell and up-sell opportunities for its existing clientele, analyze pipeline opportunities, generate business from new clientele, maximize value from their CRM applications, and analyze customer spending trends. Sales analytics with predictive analytics capabilities enables executives to leverage from varying customer behavior and determine actionable sales targets. It provides methods to identify, comprehend, model, track, and augment organization’s sales performance through predictive models. Sales analytics also helps sales representatives to track customer and product performance at every stage and assist the sales executives from lead generation to deal closures. Customer analytics is used by companies to better understand customer behavior and make strategic business decisions through customer segmentation and predictive analytics. It is a systematic analysis of the customer insights, which assist the organization to identify and target the customers for marketing programs from their behavioral prediction. It helps organizations to retain the existing customers, maximize the customer lifecycle value, and gain customer loyalty. The web and social media analytics solutions analysis entire web-based and social media data for measuring, collecting, analyzing, and reporting of internet data for the purposes of understanding and optimizing customer’s web usage. This solution assists to monitor traction and engagement with online customer messages while exploring the challenges and potential controversies around aligning marketing strategy. Rising need of digital marketers, advertisers, and publishers to segment their premium buyers from other customers, track the overall website and social media pages visitor traffic, manage ad campaigns, and improve complete web and social media performance. Supply chain analytics aims to improve operational efficiency and effectiveness by enabling data-driven decisions at strategic, operational, and tactical levels. It assists companies to deliver growth in revenues, improve margins, manage working capital in a better way and enhance the overall control points across the supply chain. Companies across all industries witnessing petabytes of data being generated across their supply chain, from procurement and sourcing of raw materials from manufacturing, distribution, and logistics of the refined goods. The businesses thus need to extract useful insights from this huge data which further helps the business owners in making effective strategic decisions. Network analytics solution assists companies to identify and resolve most of the IT infrastructure issues before they impact operational performance. It enables organizations to monitor and analyze the data running across the network to optimize network performance and assists in taking proactive measures. The number of connected devices across the world is expected to grow enormously in the coming years with the increasing adoption of IoT, which in turn will be responsible for increasing the complexity on the networks. To tackle this situation and to make a mark in the dynamic telecom environment, adoption of network analytic solutions is expected to rise significantly in the coming years. What are the upcoming industry applications for predictive analytics? Changing regional data regulations leading to the restructuring of analytics solutions to meet changing data requirements are the major factors restraining the growth of the market. Opportunities such as the increased awareness has accelerated the development of better analytics tools, and the advent of machine learning and Artificial Intelligence (AI) is enhancing the predictive analytics market. Key players in the market include SAS Institute (US), IBM (US), SAP (Germany), Microsoft (US), FICO (US), RapidMiner (US), Angoss Software (Canada), and Tableau Software (US). These vendors have adopted different growth strategies, such as new product launches, partnerships and collaborations, and mergers and acquisitions, to expand their offerings in the predictive analytics market. Do you think implementing predictive analysts will be a good strategy? Would it be good with an automation platform? According to us, implementing predictive analytics would be a good strategy for an organization: With the increasing volume and variety of business data, due to increasing adoption of emerging technologies such as Artificial Intelligence, Machine Learning, Internet of Things and Mobility, organizations require real-time insights from those datasets for faster and better decision making. Predictive analytics helps industries in understanding the customer perception by providing competitive market edge and an ability to orchestrate business decisions rapidly. It also provides operational excellence by improving productivity and profitability across organizations, and help the organization for achieving financial efficiency, informed decision making, and better data visualization for both structured as well as unstructured data sets. Organizations across industry verticals (including BFSI, Retail, Healthcare, Government, Telecom, and so on) are implementing predictive analytics for multiple business applications to get these benefits and most of them are achieving better results. For example, HSBC recently partnered with an AI start-up Ayasdi to automate anti-money laundering investigations using predictive modelling and they saw the number of investigations by 20% without reducing the number of cases referred for more scrutiny. Vodafone is using CleverTap’s customer analytics solution to engage their users and drive conversions. Using the predictive analytics tool, Vodafone could successfully scale personalized campaigns to double the conversions. Hence, predictive analytics is considered as a new mantra for businesses across industries because it helps organizations achieving varied range of business outcomes, higher customer satisfaction, and efficient operations. It is now widely being used by marketing, sales and finance teams to achieve desirable business performance.